Caroline Orford’s cows perfectly embodied the conflict between tradition and modern life that developed during World War I. Mrs Orford claimed that her traditional right to sell milk in St. James’s Park dated back to King James I, who laid out the park in the seventeenth century. There was no proof of this story but Mrs Orford’s family had kept cows in the park from at least the 1880s until 1905, milking them on demand for thirsty children, and carrying in milk after cows were banned from the park. A petition to the King to let her stay attracted more than 3,000 signatures from all parts of London, and stretched to almost 100 feet long. The Office of Works finally did evict Mrs Orford from St James’s Park in December 1922. A modern refreshment building managed by a catering firm opened elsewhere in the park, while the new Guard’s Memorial dominated the location where Caroline Orford and her cows once held sway. Down but not out, Mrs. Orford boldly tried (though unsuccessfully) to claim compensation and even a civil pension, before finally dropping out of the historical record and dying in 1935. 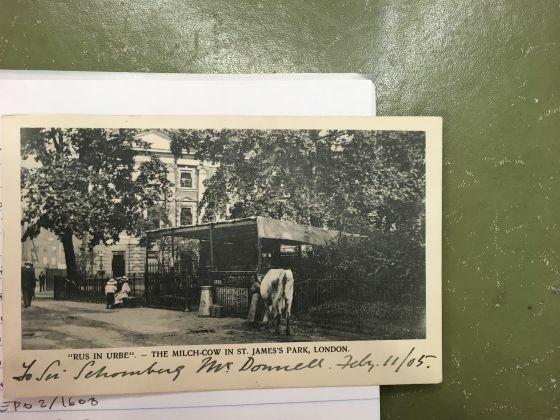 Stroll down from the Guard's Memorial where Mrs Orford's stall stood to Duck Island Cottage and find out more about St James's Park during the First World War at our small, free exhibition, until 2 August.